The police in the Dominican Republic continue damaging their credibility with those in the diaspora that hope to one day be able to return to a country that even remotely resembles a free and progressive state composed of ethnic Dominicans. Although most sensible Dominicans are busy calling for the police to help the military round-up foreigners who entered the country illegally, the authorities are instead busy wasting time and jeopardizing the future of otherwise law-abiding citizens. According to Noticias SIN, police in the city of Bani set-up a "preventive checkpoint," stopping any citizen they saw fit, but not bothering to enforce immigration law. Although intense pressure from groups such as George Soros' Open Society have led to the Dominican government basically halting the deportation of undocumented individuals living on its soil, even as The Samaritan Foundation, a Canadian NGO, builds two city-sized slums with thousands of newly-arrived, undocumented Haitian migrants, there is little pressure raining down on the government for harassing citizens for what are otherwise free speech violations. 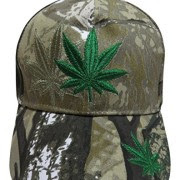 So far, the evidence seems to indicate that hats with cannabis insignias only reduce the risk of skin cancer on the face, while also increasing a rider's ability to see under the harsh sunlight of the Caribbean, thereby increasing road safety. Since cannabis is not widely-smoked in the Dominican Republic, there is a very real probability that the individual arrested did not even know what he was "promoting." Dominican law 50-88 makes it a punishable act to promote controlled substances, even though cannabis leaves are not smokable. Perplexingly, however, there is no law criminalizing the spread of cholera by those who have illegally entered the country. An individual wearing a hat on a motorcycle does not represent an imminent threat to the stability of the Republic or the survival of the Dominican people as a distinct group with its own culture and heritage, but a pregnant woman crossing the border and giving birth for free in a hospital does. Many citizens believe that instead of wasting resources on things that don't threaten the future of the Republic, authorities could better protect the border.